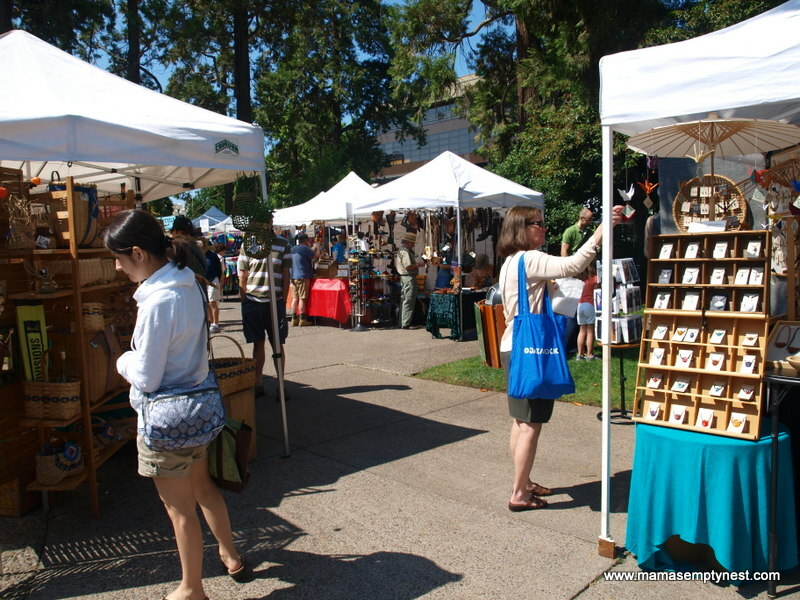 A visit to Eugene, Oregon, would not be complete without a trip to the Eugene Saturday Market or as my nephew calls it – The Hippie Market. 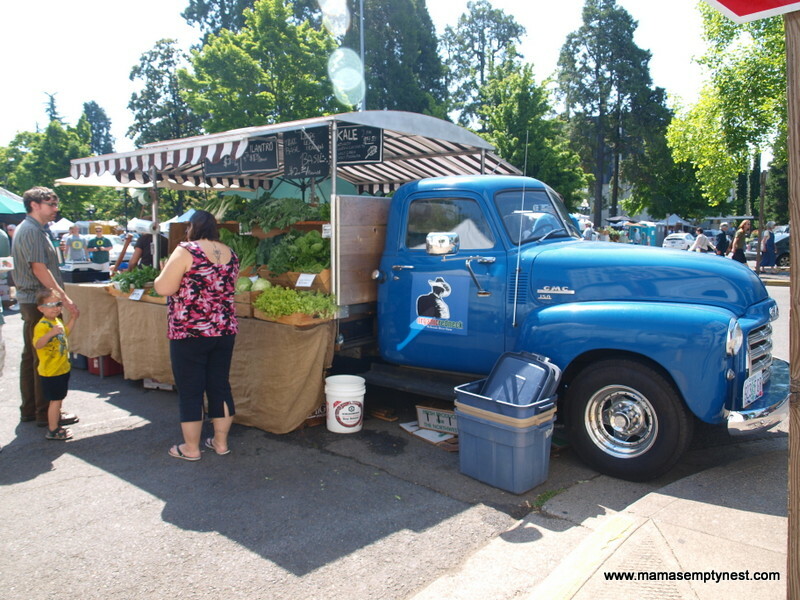 The Eugene Saturday Market is the oldest weekly open air market in the U.S. and has been in continuous operation since 1970. It is open every Saturday from April until mid-November regardless of weather. Every item sold must be handcrafted and sold by the crafter or their family members. 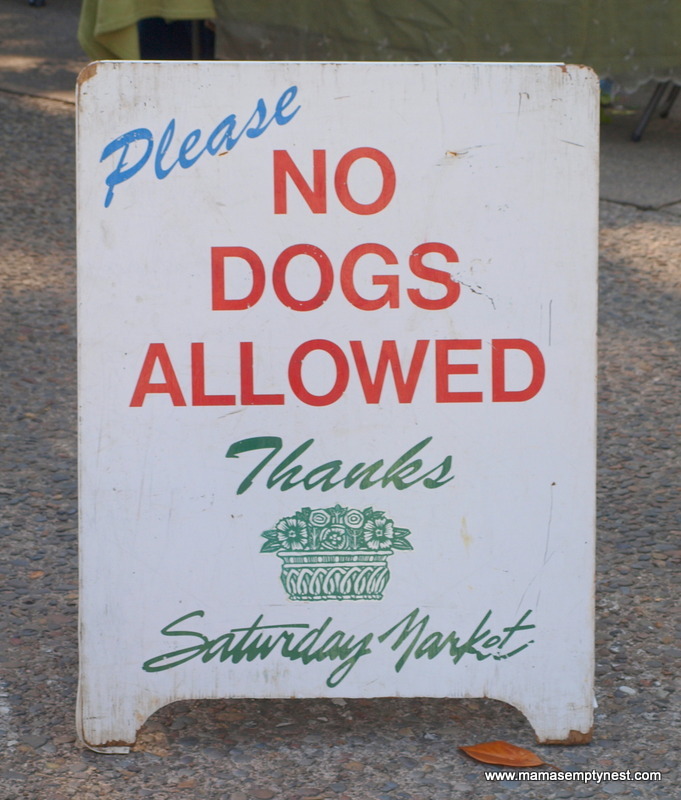 This is the only sign that I saw that listed the name, Saturday Market. Oh, and dogs were in abundance. To say that many of the wares sold at the market reflect the culture or counter-culture atmosphere prevalent in Eugene would be an understatement. In other words, this is the place that you would come to find all sorts of locally handcrafted goods especially those items desired by the local hippie population. If you know what I mean. I love the eclectic feel to the Saturday Market. My goal was to purchase some tie dyed shirts for my girls. The masters of all things tie dyed live in Eugene. I purchased my desired items from Maggie of Maggie’s Farm. Maggie grew up in Kirksville, Missouri, where two of my kids attended college. It’s a small world. 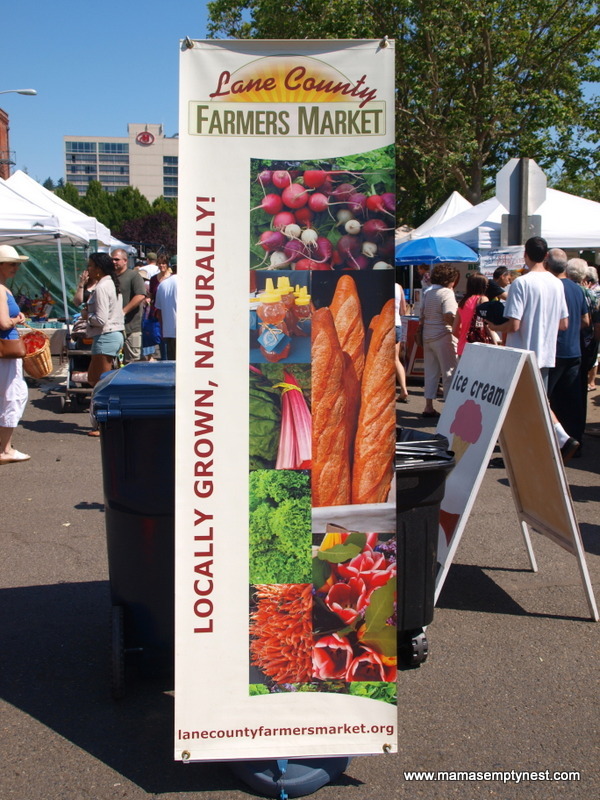 The Lane County Farmers’ Market is adjacent to the Eugene Saturday Market and is open to all Oregon residents who wish to sell locally grown, mostly organic, produce, flowers, gardening plants, and food items. 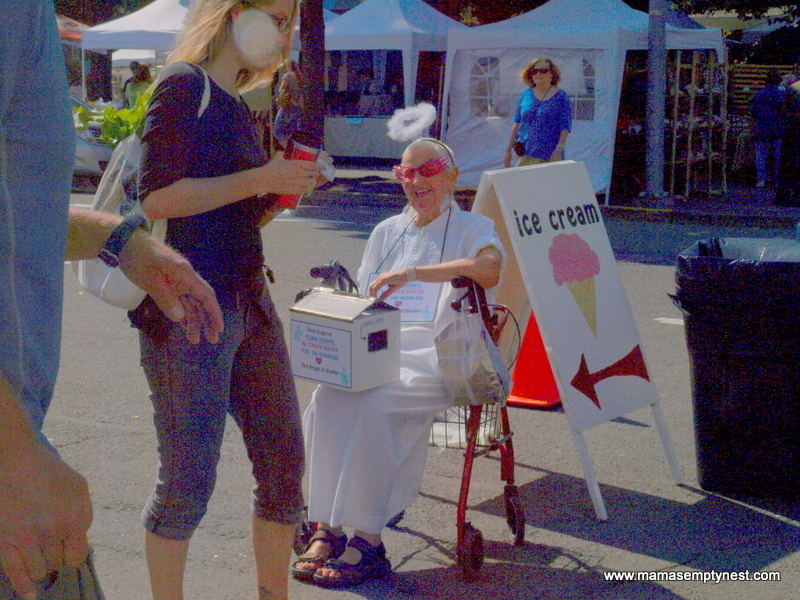 The elderly hippie dressed as an angel – halo and all! Right inside the Farmers’ Market there is a spot that one is allowed to use for either performing or soliciting. I’m not sure what the limitations are, if any, on occupying this spot, but other than the elderly angel woman, we saw mostly performers. Pike Place Market in Seattle has a number of these same type of spots or positions (they are numbered there) throughout the area for performers. The first occupant we saw on this day was an elderly woman, obviously a hippie, dressed as an angel, sitting on the seat of her walker and soliciting for the local homeless shelter. Seeing people like this is not uncommon or considered unusual in Eugene. She was very happy talking to the shoppers and soliciting for her cause. I thought she was just hilarious. 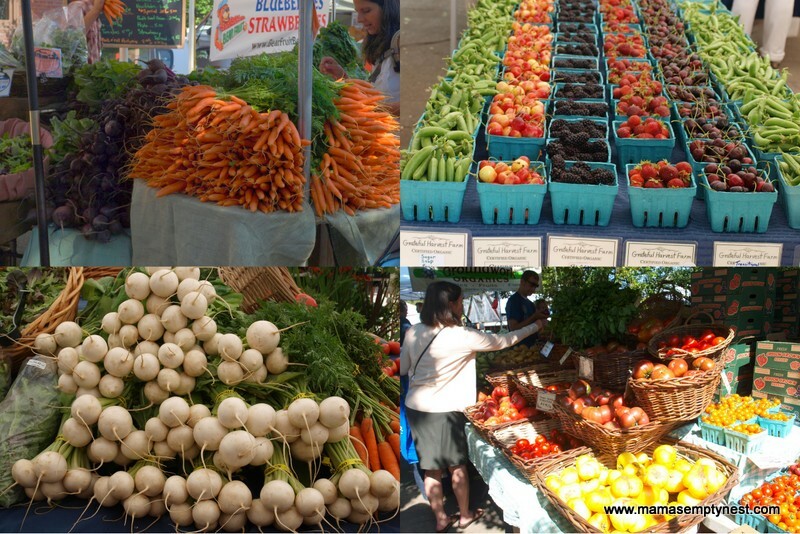 A collage of some of the produce at the Farmers’ Market. Those round white radish looking root vegetables are Japanese turnips. We tasted some raw slices of them, and they were crispy and mild. My sister purchased a variety of fresh tomatoes – red, yellow, and heirloom which she later made into a tomato tart. Like most farmers’ markets, there was an abundance of beautiful, locally grown fruits and vegetables. Berries were in season, and they were large, juicy, and flavorful. We enjoyed some freshly made pasties, honey, goat cheese, and sausages in addition to the produce. An old truck that served as transportation and vendor display. Vendors at farmers’ markets are passionate about what they grow and make and it is always a learning experience to attend them. Enjoying the products is the bonus. Later in the weekend, we would use the goat cheese in Fried Stuffed Zucchini Blossoms and a variety of tomatoes in a Tomato Tart. A visit to local markets gives one an appreciation for local culture and cuisine. This ranks as one of my favorite things to do at home as well as in different places around the country and around the world. I can’t wait to visit it! I love our Farmer’s Market in St. Paul – and, experiencing those in other areas of the country – the colors are so vibrant, it just makes you want to make something fresh to eat! In the Winter they move to the Fair grounds where it is warm and dry. We will take you when you visit. Yes, I read that in November and December, they move there. That is a nice way to make the market have a longer season. I read that between 3,000 and 5,000 people visit on an average weekend so it’s an important part of the social and cultural scene as well as economy. One block East of the Market is the Courthouse. Here is the larger free speach area. So sorry I neglected to point that out to you. We were too busy eating yummy pastries and visiting the woman who grows garbonzo beans. Many free speach participants camp there and one may purchase items of a certain nature not sold at the booths in the Saturday Market. Yes, Eugene and eclectic go together! I wanted to get more pictures of the “older” hippies because they are so common and natural in Eugene, but I didn’t want to be intrusive either.